This week, the Philadelphia Convention and Visitors Bureau honored one of their own, with public recognition, an award at the recent PHL Diversity Luncheon, and this lovely written note of appreciation. 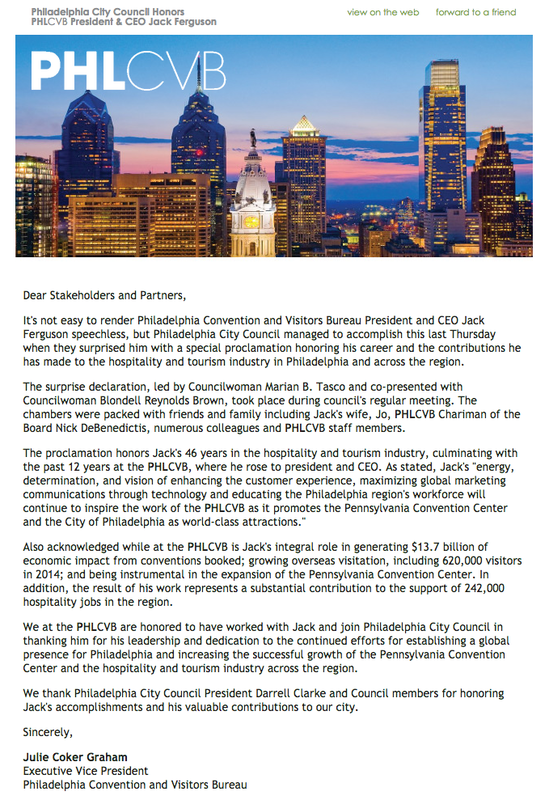 Jack Ferguson is a key player in the success of Philadelphia’s tourism industry, and he was recognized for it in the following letter from Julie Coker Graham, the Executive Vice President of PHLCVB. We couldn’t agree more with Julie’s words of thanks, and would like to extend that to Jack and the entire PHL organization. In honor of Jack Ferguson’s retirement, PHLDiversity created a scholarship, in partnership with Meeting Planners International (MPI), that will allow a minority professional to attend the nationally recognized annual MPI World Education Congress (WEC). More information can be found here. We’ve had the honor of documenting momentous events for PHL at the Philadelphia Convention Center and beyond. We’ve provided photojournalistic coverage from the beginning of the new union labor laws, to the multi-day Bio Conference which drew large international crowds, to the recent events involving the World Meeting of Families and the Papal visit, we’ve seen it all, and been beyond blessed because of it. Jack Ferguson has had a positive response to our work (he even requested his own copy of our WMOF photos! ), and it truly is amazing to know we’re contributing a small part to the economic and social growth of our city that we love so much. We’re big fans of Jack, and want to say thank you to him and PHL for helping us make our small contribution to Philadelphia.